NUFC v MUFC match preview | NUFC Blog. As Manchester City celebrate their 1-0 FA Cup win over their rivals Manchester United, Newcastle prepare to break a 7 season curse. Yes, it’s been 7 seasons since we’ve beaten Manchester United at the Cathedral on the Hill. The last time coming with a 4-3 victory, courtesy of an own goal, with the late, great Sir Bobby Robson steering our black and white ship. Of that game, both Steve Harper and Shola Ameobi remain – both of them being unused substitutes in the last fixture. Wayne Rooney has been declared available for the game after serving his ban for swearing, and perhaps more worryingly, veteran Ryan Giggs will also be available for selection. Long time Manchester United manager, Sir Alex Ferguson, will be looking for more than just a ‘response’ against the Magpies and will be looking to extend that 7 season statistic as Arsenal prepare to shorten the 6 point lead, and Chelsea still struggling to find form after a blistering start to their campaign to retain the Premier League title. Anything other than a loss will see us reclaim 9th position from Aston Villa on goal difference, while a loss by 17 goals would see us fall below West Brom in 11th. Nice to know, eh? Kevin Nolan remains sidelined after picking up his 10th yellow card against Wolves two weeks ago and our injury list is growing ever longer. Our very own man in the mask, Shola Ameobi, is provisionally available, Leon Best is out for the season with both Ben Arfa hoping to return to full training along with Dan Gosling. Alan Smith will also be out after picking up another injury earlier in the season against a certain lot of unwashed knuckle draggers – and I’m not talking about Liverpool. On the positive side, the rumour mill is churning with quiet whisperings of Ireland’s willingness to play in this fixture so perhaps he will make his debut after all and our Ivorian midfielder, Cheik Tioté, is set to take up his mantle once again in the centre of midfield and will no doubt be itching to get back into the action after his 2 game ban. After a decent performance against Villa, Newcastle will also be looking to hit back and make Manchester United’s life as difficult as possible. “It is a fixture I genuinely believe Sir Alex will be very wary of. Maybe not so much because he fears us as a team, but because he fears the ground and the reaction it can inspire the team to. For example, the Arsenal game – we were 4-0 down and our first goal goes in and suddenly you felt the crowd erupt and impact on the game. Edwin, of course, announced his retirement this season and as a result this be the last time we see him grace the hallowed turf in a competitive fixture, so for all of those who are going, be sure to give him a warm send off – hopefully after we’ve snatched all 3 points from his grasp. Everybody knows that this will be a hard game to play, but as we saw at the season opener, our team has the ability to push and make lives a little more difficult for the Manchester side. NUFCBlog Author: Thump	Some say his bones are black and white but that is yet to be medically proven. Currently writes for a few different publications and likes to assert his imaginary authority on nobody in particular. Beware: eats children. Thump has written 36 articles on this blog. Mmmm. Pardew’s manifesting a lot of faith in our chances tonight – he’s got to I suppose! Whichever, there’s one thing for sure, it’ll be an uphil struggle and we really must just try to go at ’em. Hark back to Keegan’s mantra and just attack, attack and attack – it’s no good trying to play fancy football. If the ball’s in Man U’s half, then they can’t score against us! Im toon thru and thru , but find it hard to see us score against these guys since we lost AC to the scousers , fraid I see us losing …FOUR – NOWT , sorry but methinks they will be hurting after the citeh loss ! Good point and I wonder whether that’s occured to Krul – if it has, it may just give him the incentive to put on a super show tonight! Tough mission for Newcastle as Rooney returns for United and Hernandez is in good shape scoring in every match he plays. Still, Newcastle could get a draw in this match. poignant the article was written by thump,is that a portent or what?thumped is what the reality could be after 90 minutes.if manure get into their stride early on,we could be out of it by half time.we also have to ask ourselves whether we have anything in the armoury to hurt them,looking at recent performances,you would have to say doubtful.we will have to hope they have an off night,or go down to tem men.we need something like that to happen tonight,also like the saying,”the sun shines on a dogs a**e sometimes”. did anyone see the stats in the sun newspaper between amoebi and rooney? Dont expect us to get anything out of the game tonight , just hope they dont get goal crazy on us . The important thing is not to pick up any injurys or red cards so we can go at Blackpool full strength and hell bent on getting the 3 points that would push us over the saftey line . Maarten Stekelenburg of Ajax is the new Dutch ‘keeper, nufc337. 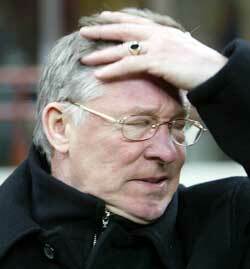 I wouldn’t like to be Alex Ferguson tonight. We’re gannin’ to knack em! Pardwho knows feck all about motivating players before a big match. Discipline is not what is required tonight. Feckin passion, feeling and desire is what every player needs to show tonight. The Mancs are sore at being beaten, so there’s doubt in their minds. Let’s increase that uncertainty and get at them. Dont let them settle, take their confidence and shove it up their a@@ses. However if Pardwho the Clueless is still manager next season, I will personally take a large bag of shite smelling stuff and dump it on him as he has no right to be in charge of a top tier club. Down to the Fatman once again. They did used to call him ‘Mr. Motivator’ though, Andy. Links for the game if anyone needs any. ‘silversportz’ on Veetle looks canny. Can see Sir Alex’s ‘whiskynose’ in HD style detail! I could be wrong here but I have a feeling that the “Thought Police” or whatever they’re called nowadays look in at these sort of sites and take link information before trying to shut them down. The last occasion ocurred a couple of weeks ago with the Wolves game when I stupidly said I was getting a good stream from a particular site which subsequently broadcast a message saying it was no longer available due to copyright claims. Maybe we have to be a bit more clever in terms of identifying url’s in future ? They just go straight to the source, Andy, eg sites like Veetle, and link aggregators like myp2p. Joey should have took that on like. Good pressure. We are hammering them lol Enrique & Gutierrez on fire! Bloody hell, we’re bossing the game so far. We’ve certainly had them on the ropes for a while, but Manchester are starting to get back in a bit. Good start though so far. See the thing is, you can’t score too early and you can’t score too late. Man U have a lot of ability in them and they finish games strongly. He must be a bit rusty with players names, its happened a few times recently. Toon, I think someone’s had a word in his earpiece as he’s finally mastered “Williamson” now. Guthrie is having a blinder. It feels wrong to see Chris saying “Newcastle” without being the manager of. I was beginning to thunk the ref had left his cards in the dressing room, I think when he did realise he had them it was for the accummulation of fouls by MU. I hope AP can tell Peter where the goals are located. Good game by us so far but ominously they have created the better chances, 2nd half could be nerve-wracking. I think Shola has had a canny game so far. Second half is starting. Now with Man U, this is basically the same as the first kick off – I’ve a feeling they’re going to come out with all guns blazing. “Get up and at em” thats the message. Make them more aware of us than we are of them. Crowd below 50k should tell Fatman a thing or two. Get out of our club. Let’s not start the anti-Ashley stuff now, Andy. For the time being we’re stuck with him and will likely be until at least the end of the season – let’s just live with what we have, eh? Thump, one or two naughty words can get comments sent for review. I think you’ll find they’re quotation marks TF. IMO Lovenkrands, in the BPL, is a dead man walking. Does very little considering his so called experience. Give Airey a shout or play Ireland behind Shirley in fact do anything rather than leave this passenger on the pitch. BTW Thump I am always in anti Fatman mode because I know he’s not good for this club – pure and simple. No one in the forward line is good enough to score. Pardwho should think about his options and crowd the midfield with goalscoring midfielders or with m/f’s who can score. I can’t be bothered to argue but I will say this: if it wasn’t for Ashley’s money, we’d be in dire trouble. Someone, if the Fatman had fecked off, would have bought the club or the crooked bandits would have had to reduce thier sale price. He’s not the saviour, he’s making money from this club along with his “loan”. If Owen scores I’m gannin’ radgie. Am I the only one who actually likes Mihael Owen? If Owen scores we’ll have fecked up. This club is as good as the Mancs but we, and the players, have to BELIEVE in it. Think so, Toon. Even Liverpool fans didn’t like him that much! Happy for the point, if I’m honest. Bit disappointed that we didn’t get all 3 given our performance, but you have to give credit to Van Der Saar who really kept the match even at times. Well done, lads. Committed performance and a point – I’m happy. Well played Toon. That shows you’re not that far away from competing with the best. Shoulda won that with a nailed on pen. That should shut up a few of our ‘detractors’, probably won’t like. Bwahaha did you lads see Cheik’s interview? “It’s a good point for the team – but we know that United isn’t really a big team” with the widest grin I’ve seen on a man. great work so far mate, aye i’ll get on the report real soon. Well i am just ecstatic , never in my wildest dreams did i think we would get anything from this game and started shiting bricks when the money grabbing poison dwarf came on . At that point i thought it was written that the horse lover would get the winner and silence the toon army . Has Owen ever been done for that ? Well played Danny, could become a legend at SJP! A fair point, gotta be satisfied with result. Hernandes could be a good partner for Tom Daley, that was his second dive. Should have been two yellows and an early bath for him. What happened to Barton in the second half? See the pundits were rating Chiek as a £15m player now, hope Ashley don’t think so. Double it & you’ll be going in the right direction. If Enrique is worth £15m & that scouser £35m, Tiote is way up there. The whole of the press will be selling our players for us, between now & the start of next season. Cue all the usual scaredy assed crap. CLiNT thats the trouble these days the press start writing stories and then it gets on the internet and before you know it every one start believing . I SAY FCUK THEM ALL !!!!! lets just see what happens before the start of next season . with you all the way on that mate. I gotto say I thought we wud get beat today , so pleasantly surprised . Looked a bit one dimensional second half, tho very spirited . Krul looked pretty safe at the back . Lovenkrands should have put his header away , and so should giggs have planted his ! What Toon could have done with a servant such as Ryan Giggs , he must be one of the greatest players in the top tier in last 20 years amazingly fit for his age ! One Question Joey ?? WHY DO YOU HAVE TO TAKE ALL THE BLEEDING FREEKICKS SHARE THE JOY SON THERE”S A GOOD FELLAH ! Surely there must be a few midfielders at training who can bend and strike a ball from 25 – 30 yards !! Good point well done lads KTFF !! a damn sight better than giggs mate. giggs has been played sparingly for years now, he’s vastly overrated, he’s good but overrated. As is scholes. Y’right about JB taking all the free kicks mind. shearer class 250 for toon, but different position hence why strikers cannot avoid injury, always getting clattered by the back 4 , but for consistency I admire giggs as a true pro, him in black and white would have been unbelievable. Yeah Joey , eh , needs to get a tape of the match and see how greedy he is , surely Jonas who incidentally first half , gave manu flank a hiding, why cant he git the ball off barton !! At last, a sight to behold….. Lousie Taylor’s written something positive about us! Could she have realised she’s been backing the wrong team ove the years? worky, Hugh, thump, if you’re out there there’s a match report ready to go up. Sorry, i’m no word press whizz. I’m on to it now, Clint. Had to rush out this morning. sorry you get stuck with it. I need a couple of WP lessons & i’ll be sweet i’m sure. Clint, I have to say that it’s a very good report overall. Well done mate!